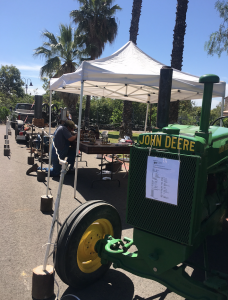 Explore Orange County’s agricultural past during the second annual Orange County Jamboree hosted by OC Parks and the Orange County Historical Commission. On Saturday, April 13 from 10 a.m. to 2 p.m., guests are invited to enjoy a day of agricultural-themed crafts, a petting zoo, live music, pickling demonstrations, blacksmith and antique engine displays, a photo booth, tours of the park and more! Food will also be available for purchase. Local historical societies will be on-site to help guests discover the rich history of Orange County and how to connect with historical resources in the local community. The event will also celebrate the centennial anniversary of the OC Historical Society. Irvine Ranch Historic Park is a 16.5-acre special use park that retains 24 original ranch structures that represent the proud agricultural history of Orange County. Docent-led tours of the park will begin every hour starting at 10:30 a.m., with the last tour at 1:30 p.m.
Orange County Jamboree admission is free and adults and children of all ages are encouraged to attend and participate in the fun! Parking: Free. Parking will be available at St. Thomas More Catholic Parish, 51 Market Place, Irvine, CA 92602.